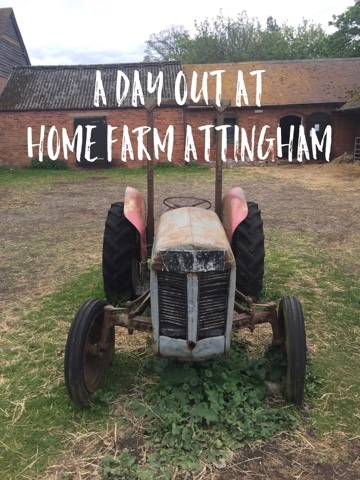 This May Day bank holiday we wanted to do something agricultural, this afternoon we achieved this with a visit to a Home Farm Attingham, in Atcham on the outskirts of Shrewsbury. 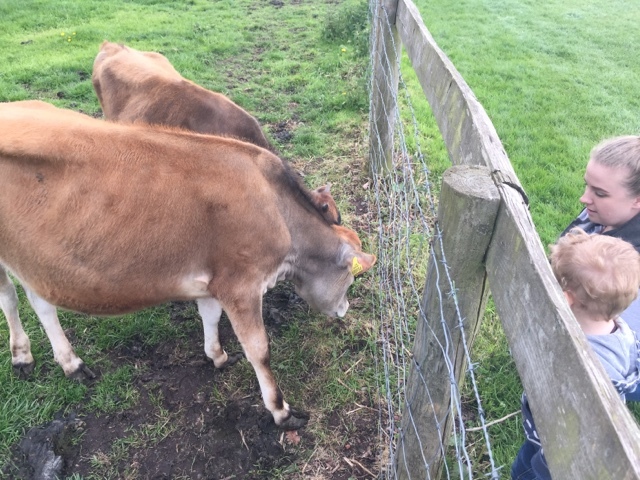 We left home and it struck me that I hadn't got any cash on me, knowing that Home Farm is relatively small open farm, I was concerned that we'd have to make contingency plans to do something else. However I was pleasantly surprised on arrival that they accepted card payments (hallelujah! ), not only that but I got asked for either my email address or mobile number and they would send a copy of the receipt on to me (better than some larger attractions). We were given a leaflet map and a brief overview of what events were taking place, including where to go. Walking through the yard now used for the onsite cafe, we enter one of the working farmyards were you are greeted by an old tractor that children can play with. Just off the yard there were a number of pens that were housing young calves and some hens that had joined them. 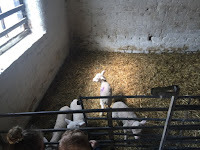 In one of the nearby rooms four lambs were vying for the attention of anyone that came into the room, while in the opposite corner some chicks sat under a heat lamp. Just round the corner is the milking parlour that houses an automated milking machine. When we entered the room, the farmer was keeping an eye on things and gave us an insight as how the machine worked. Upon leaving the milking parlour we headed away from the farm building out towards the fields. The first animals we came across were geese, peacocks and a field of Miniature Shetland Ponies. Shortly afterwards we spotted a pen with pigs in. The wide path then leads you to a field containing cows and sheep, who were happy to push their heads through the fence and eat some grass from our hands. 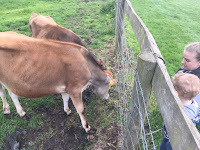 As we walked back to the farmyard to take part in one of the two daily feeds of the lambs we spotted a small play area for children, which had a slide, swings, some balance apparatus and a fallen tree to climb over. 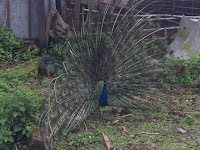 From the playground we got to observe a peacock trying to entice a peahen with his amazing fanned tail. Back at the main yard for 16:00, the farmer brought four bottles of milk out and released the lambs from their pen. I found it amazing that they ran straight to a bottle and started to take milk from a strangers. My little boy really enjoyed this part of the trip even if he had a bit of difficulty holding on to the bottle, with the lambs eager to to drain it! I spotted an open entrance, so being curious I had a wander across and found some more chickens and some hogs which could easily have been missed if I hadn't been nosey. As we headed out, we stopped for a quick chat to let our little boy play with one of the many sit-on tractors available to visitors.